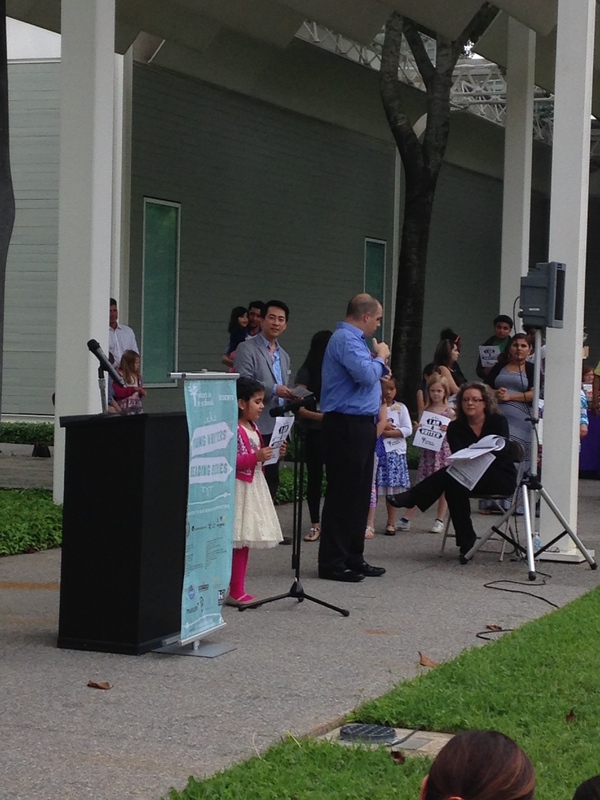 Even the littlest members of the community had a chance to participate in the day’s events. 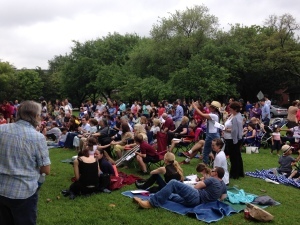 A crowd of over one hundred people gathered to hear a diverse line-up of WITS students read their original poems and flash fiction. Families on blankets and puppies frolicking on the lawn complemented the scene. On the other end of the educational spectrum, graduate students of the creative writing program at the University of Houston, were also in attendance, with the latest issue of Gulf Coast. The Gulf Coast team had also developed a menu of readings and panels at the Houston Center for Photography. 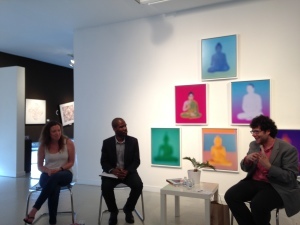 I attended an intimate discussion on interdisciplinary practices entitled “Cross-Media Influence in the Arts: A Ligatures Event,” in which Benjamin Rybeck, Talia Mailman, and moderator Brian Bowers expanded on how “art imitates art.” Rybeck explained how his love of film strengthens his fiction. Mailman revealed how her work as a harpist bolsters her writing, as well. She described how teaching “phrasing and dynamic changes” to a 12-year old music student, made her realize how closely these terms align with the art of the sentence. Bowers expounded on how collaborating with artists and writers in other genres “create something unique and distinct.” The MenilFest was certainly demonstrating that no one need be confined to one mode of expression. 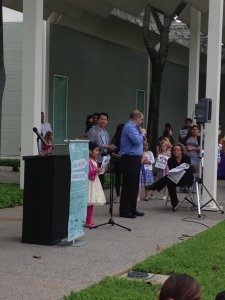 An invitation to cake and piñatas to celebrate the Zine Fest’s “unbirthday party” at The Menil Collection Bookstore was briefly alluring, but I headed over to the Inprint Poetry Buskers instead. Local authors were composing personalized poems, on the spot, for free. I spoke with Sam Dinger, seasoned Inprint busker, who listed some prompts that writers were given, including the theme “after the flood” and a directive to celebrate a brother’s birthday. He also described special moments when community members (a young girl, an older man) helped the writers come up with collaborative material. Also in the spirit of collaboration, Glass Mountain, UH’s undergraduate literary journal, featured an interactive word game at their table. Participants could arrange and re-arrange cardboard cutouts, like an enlarged version of refrigerator magnets, to make new poems. Each word, I discovered, was taken from the story “Glass Mountain” by Donald Barthelme, postmodernist legend, Houstonian, and co-founder of the Creative Writing Program at UH. On a global note, I caught the “Passing the Transnational Baton” reading, featuring Henk Roussow, Jeni McFarland, Brian Bowers, Matthew Salesses, and Elizabeth Davies. Roussow, from South Africa, performed part of his long poem Camissa, a clear-eyed ode to Cape Town, full of dialects, the call of street vendors, zebras and Mercedes, creosote and “trackies.” McFarland read what she termed “a modern noir telling of Rumpelstiltskin,” set in Florida, and, impressively, written in trochaic pentameter. Bowers presented sensual love poems, and “jazzy blues” with the help of some audience finger-snapping. 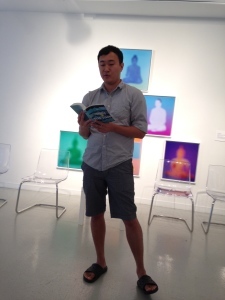 Salesses read from his newest novel, The Hundred-Year Flood, which swings back and forth between Prague and Boston. Finally, Australian-born Davies acknowledged that she was reading to a roomful of writers and chose a very funny piece of flash fiction about “the creative process and mania.” These huge talents truly reflected international flavor of our city. In a festival this size, there’s no way I could see and hear all that was offered. My chronicle skipped music in the Cy Twombly Gallery, in the Rothko Chapel, and in the Sculpture Park, family film screenings in the Menil Library, and more. 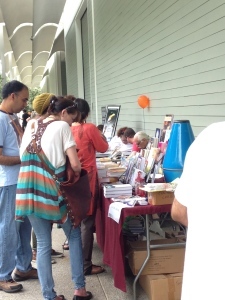 There were even more literary events than an intrepid girl reporter could get to. Next spring, I encourage you to make up your own itinerary and see what you find!